The propriety of the religious dance was hotly contested at various epochs in the history of the Church. A council prohibited the practice in 692, but it was still very general in 1617. Saint Augustine was against it, but Saint Chrysostom took part in it. In the six­teenth century the dance was accompanied by a solemn game of ball in many French churches, and in 1683 it was the duty of the senior canon to lead a dance of choir-boys in the Paris Cathedral. I enjoyed the privilege of witnessing this unique dance several days in succession, during the octave of the Immaculate Conception of the Blessed Virgin (Dec. 8th), and I shall always look back upon it as one of the dreamiest and most fascinating, yet fantastic, scenes I have ever beheld. Seville Cathedral is in a chronic state of restoration. Just now the high altar, in front of which the dance has been held from time immemorial, is surrounded by planks and rubbish heaps, where I have seen workmen lounging about with cigarettes in their mouths. All the cathedral services are therefore trans­ferred to a large side chapel, known as the Sagrario, which does duty as parish church This is large enough for an imposing display and the accommodation of a numerous congregation, about which the less said the better. The ceremony is looked upon too much as a sight, and besides heretic tourists, who may be expected to jostle and giggle anywhere, there are fat women in mantillas who bark the shins of. the devout with their camp stools, and ubiquitous street urchins who fight their way to the front, with yells of laughter, burrowing through legs and scattering petticoats. When I entered the Psalms were being chanted in the carved stalls of the choir at the back of the church. 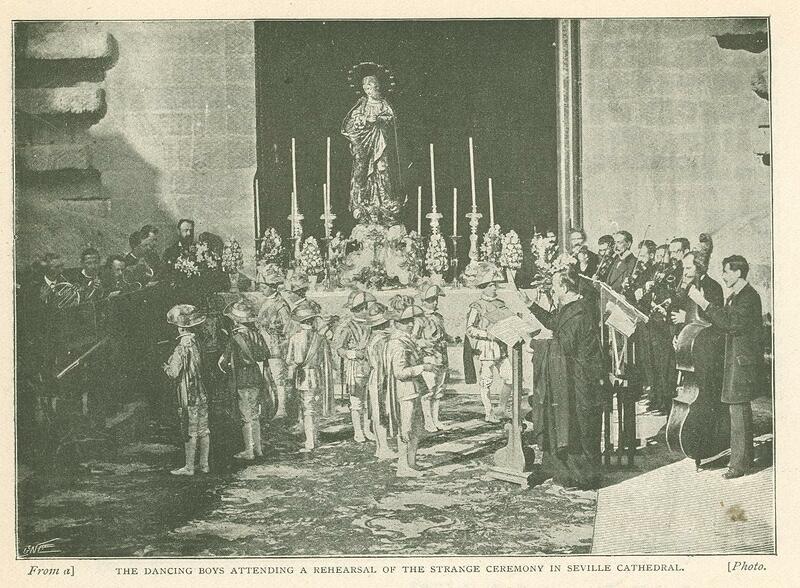 I made my way diplomatically up to the rails of the altar, where a youth in a surplice was engaged in kindling the sixty-four large candles, which soon emitted a blaze of light, rendered all the more effective by the reflection of the silver reredos and countless silver images. At the back and sides of the altar were immense crimson curtains with wide stripes of gold galoon, reaching right up to the roof, and heightening the effect of the brilliant altar with its magnifi­cent blue cloth, richly embroidered with gold. A few sumptuous cushions of blue and gold brocade were dotted about within the rails, and there were two rows of benches, draped with crimson and gold, facing each other immediately in front of the altar. A row of huge silver candlesticks, with candles over 5ft. high, guarded the altar rails; but the body of the church was shrouded in dim, religious darkness, which, as at a theatre, rendered the great spec­tacle all the more conspicuous and impressive. It would be impossible to conceive a more imposing effect. Various ecclesiastics - mostly clad in violet ­emerged from a door near the back of the altar, and made their way solemnly down to the choir, kneeling, as they passed, to the Host, which was set up in a gold monstrance above the image of Our Lady upon the altar. Among them was the Cardinal Archbishop of Seville, a divine of surprisingly youthful appearance, with a scarlet train eight yards long. Then came the thurifers, clad in cloaks of faint, mysterious colors, and of exceeding softness and thickness. A huge hood hung down to their waists, which were girt with long silken cords. The incense was kindled; great gusts of blue smoke formed above the censers, broke gently into exquisite grey curls, and immediately diffused themselves, as if by magic, into that penetrating perfume which overpowers the senses by a veritable odor of sanctity. Surely no accessories could be more per­fect for the dramatic, yet essentially reli­gious, performance which was about to take place. Two monster sil­ver candlesticks were now borne in by youths in red, who held them before the altar with a motion as if presenting arms, and then carried them off to the sides. Then the heavy red curtains on the north side of the altar were drawn back, revealing the desks and seats of the orchestra. Two of the sets boys were grouped beside the conductor in the most artistic attitudes imaginable, and looked amazingly dreamlike through the incense in the dim light. Slowly the musicians assembled, just as in a theatre, lounging, gossiping, twanging their stringed instruments to get them into tune. The conductor was a typical Spanish priest, all shaven and shorn, ruddy, and with deep lines around the mouth and eyes. At last the performers filed in - two rows of five from either side of the altar; they made slight genuflections, and ranged themselves on their knees in two rows before their benches. As the clergy streamed up from the choir and took their places within the rails - the Arch­bishop on his throne, the others wherever there was a vacant space-I had ample opportunity to study the boys and their costume. There were ten of them. The word seis means six, and refers to the six principal boys, who enjoy the title and emoluments of seises, the four others ranking merely as supernumeraries. All were dressed in blue silk coats with wide stripes of gold galoon and puffed sleeves of Philip and Mary's period; short little capes, which twirled about vigorously in the movements of the dance; laced collars; streamers at the back of the arms; scarves across the. breast; white silk shoes and stockings. Under their arms they carried blue hats with white feathers, adorned with gold galoon and having the brim turned straight up in front-almost the fashion­able lady's hat of the present day. One might have thought it a ballet of young cavaliers in an opera. The organ struck. up the overture of the sweet, simple seis music, as if to give the key­note. Almost before the last sound had died away the orchestra of stringed instruments took up the tune, and a number of priests in out­door dress, crowded at the north end of the altar, began the strange, old world song of the seises. It is almost impossible to give an idea of the character of the music in words, but I have succeeded, with some considerable trouble, in obtaining the score, which has never hitherto been correctly or completely published. It is certainly not the usual conception of sacred or even of classical music. Still less is it, as I heard an ignorant Yankee in the crowd protest, a variety jingle. Perhaps the nearest approach we know is to be found in an opera comique as opposed to an opera bouffe. This, however, gives a "Very poor idea of its character, for it is in reality the typical accompaniment of the medieval mystery plays - tender yet cheerful, simple but affecting, and at all times bewilder­ing. It must be heard a great many times in order to be understood. It was striking enough upon the organ, but when the violins and voices began, it was almost uncanny. While the priests sang the boys stood in two rows facing the altar, with their feathered hats under there arms. Then the priests ceased and the boys took up the strain. Their voices were often unpleasantly shrill and even out of tune, but their gorgeous surroundings and fantastic appearance would have carried a far less perfect performance through; it was all more or less minor, yet the vivacity predomi­nated over the pathos, and the general effect was inspiring rather than melancholy. There were abrupt alternations from forte to piano, and one noticed various little tricks of voice which showed that they had been very carefully trained. After the singing had proceeded for some little while the boys all made a little bob to the altar, and, turning round facing each other, pro­ceeded to put on their hats, adjusting the elastic at the back with some care. Then they began to sway to and fro very gently, still singing, and insensibly the dance began. It would be weari­some to describe all the figures; though it was anything but wearisome to look on. The dance may best be described as a sort of pavane, and it called up vague recollections of the minuet. One step, two steps, very slowly forward, until the two rows closely faced each other; then one at each end executed a pirouette and swept away, while the others danced back to their original positions, forming a kind of square. The pirouetting was, perhaps, the most graceful part of the performance, executed with boyish vigor, and sending capes and. streamers flying in the air. They certainly kept better time with their feet than with their voices. Presently they began to use their castanets, not with the professional rat-tat-tat-clap of the Sevillian flamenco or gipsy dancer, but with a rippling sound far more appropriate to the rhythm. Now the dance grew faster and more varied - a chasse-croise was succeeded, by a circular figure, in which the dancers followed each other round and round, swaying their bodies as they rattled their castanets, and sang rhymed couplets to "the glory of Mary and her Conception, her Con -, her Con -, her Conception," in the soft, slovenly accent of Andalusia. The finish was abrupt and uneventful, like a speech without a peroration. It was as if the conductor or the Archbishop had suddenly grown tired of the performance and given the signal to conclude it. The boys doffed their cavalier hats and sank upon their knees, the organ struck up what seemed a continuation of the seis tune, and the sight seeing portion of the congregation fought for the doors. But there still remained an impressive exhibition, well worth remaining to behold. As the priests to the north of the altar renewed their chant, small curtains on either side of the Host began to move slowly, almost imperceptibly, along a semi­circular wire. No hand could be seen at work, and it needed but a small stretch of the imagination to fancy that a miracle was in progress. At first the curtains moved no faster than the minute hand of a clock, but as they advanced it became almost possible, by watching them very closely, to detect their motion. Meanwhile the whole congregation fell upon their knees in adoration, and the singers cast furtive glances to watch lot the final eclipse of the Host by the closing of the curtains. At last they had met and the music ceased as if by enchantment, frozen in the middle of a word and a bar. 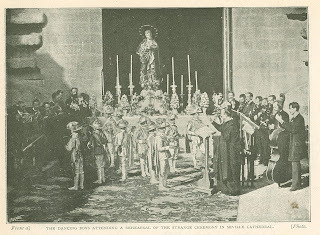 A few prayers followed; the Arch­bishop rose, made the sign of the cross in bestowal of his blessing; and a canon advanced to announce that all who had been present to the end were entitled to an indulgence of eighty days by order of His Holiness Pope Leo XIII. Originally published in the Wide World Magazine. January 1900.